← Going Back to Previous Programming. I have a disease. It is called Guiltious Momien Affliction. It’s symptoms are downplaying everything you do for your own children when you see what the mom with the perfect hair is doing with hers and not looking at all you do for your kids, but looking at what you don’t. For instance: I am throwing my kids’ two birthday parties in one day so that each has their own 1.5 hours in the spotlight and so their dad can make it and I save money by renting a bouncie castle once instead of twice. I will have one hour between these parties to transform the prehistoric dinosaur theme into a pink poodle in Paris with a splash of Scooby Doo for young males who may attend. I will have separate cakes and decor and I have different crafts/activities for both because of age differences. I have invited more than the recommended “invite the number of guests to match the age your child is turning.” Because I have Guitious Momien Affliction, I invite everyone from school and church – for my 6 year old, this is minus five kids because I had to cap at 20 which is actually 24 because we have friends staying with us. So do I feel like a great mom for doing all of this? No. Because I didn’t want to buy any presents and wrap them. I just wanted to take my 4 year old to Target and let him get what he wanted say happy birthday and call it a day. Even after staying up until midnight writing invitations so I could invite my 6 year old’s friends from school and today is the last day so I had to bring them today, I questioned my ability to mother well because i didn’t want to surprise my kid. And I feel guilty because I have nothing planned for 4 yr olds birthday, which is today, because 6 yr old has ballet practice from 5:30-7:30. There is no cake. There will be a life-sized dinosaur cake on June 17th, but because there isn’t one TODAY, I feel bad. I have been known to go over the top for birthdays, but I still seem to feel as though it is never enough. I have had super hero training and every kid had a cape. I had thirty kids at that party. Guiltious Momien Affliction is often followed by Commitmentium to InSaneAsylium. 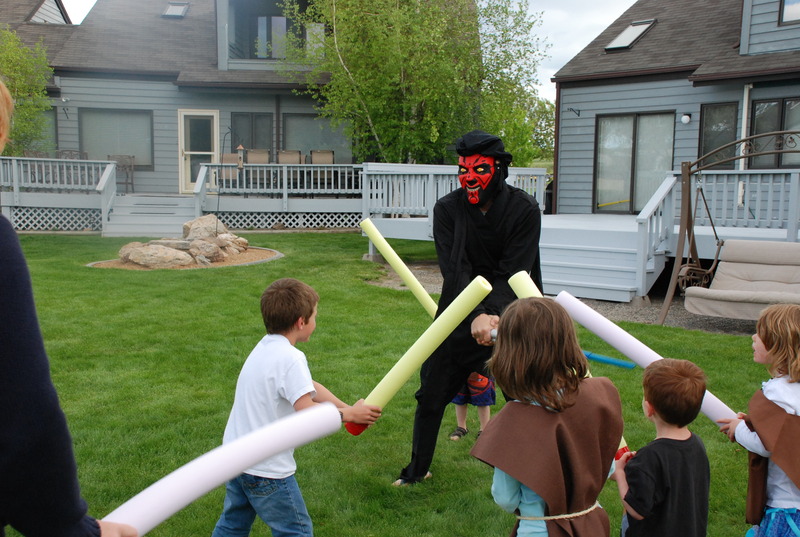 I actually had a very dignified Orthodonist dress up as Darth Maul for my 3 yr old's party and told myself this wasn't enough. I may need to enter a group home. So I have decided to dedicate my life (or at least the next fourteen years) to look for a cure. I’m starting by reading The Three-Martini Playdate: A Practical Guide to Happy Parenting and seeing how many Valium it takes until you don’t care if you change your light bulbs ever again. Ok, you do need help. You are an AWESOME mom. You’re going from “nice birthday party” to, as you said “time to commit mommy to an asylum” level of parties. I’ve found sometimes the little things can means so much to a kid. Do something little for 4 year old. Stop for ice cream (or one of those frozen yogurt places where you weight what you buy and can add as many toppings as you want) and let them pick anything they want. Or whatever tiny small thing will make him happy. Seriously. Have you read my birthday party rants? You are AMAZING. My kids want an upgrade on their mom. I’m with Kelly….are you for hire? You did (and are doing) more than most of us so pop those Valium and send some of that life size dino cake my way!! I did that once…we had 2 parties on the same day cake and ice cream followed by bowling for both groups then cake and ice cream again. I didn’t change any decor — I made 2 cakes. Deep breaths.